I really like their style, but $1700 is out of my price range. 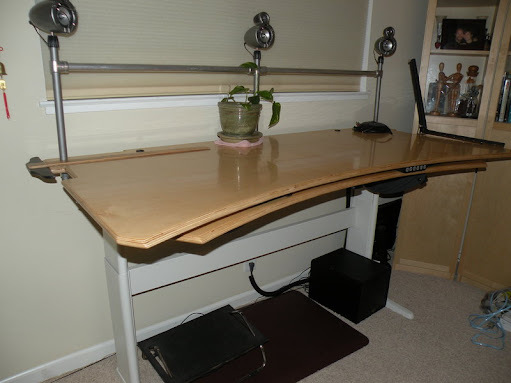 They would not sell just a desk top, so I reverse engineered the whole thing. 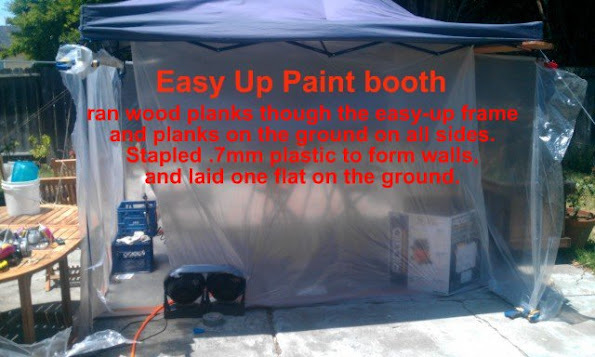 In the end, I found plywood, tools, materials, and legs for about $1000, and can create more for less. 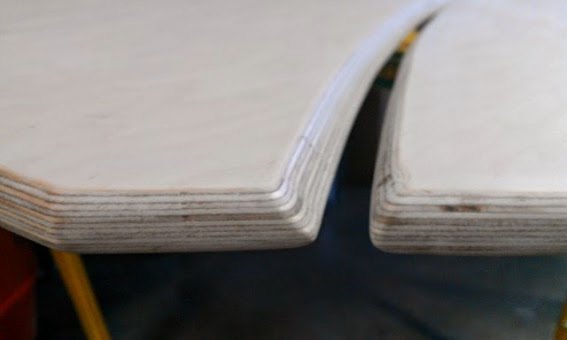 Biomorph uses furniture grade blond Maple plywood. 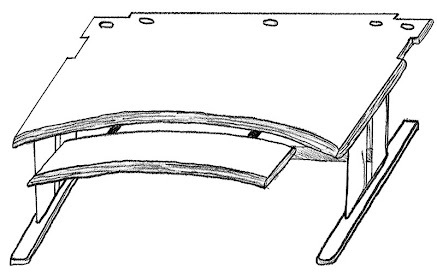 Edges are bullnosed and chamfered reveal facing the user. 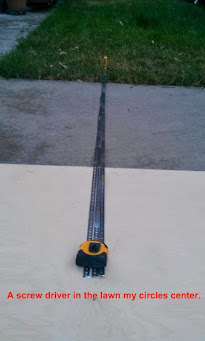 Thickness is 3/4" or 1". 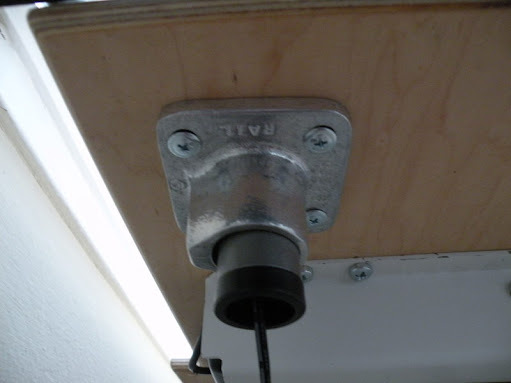 Legs use linear actuators, sometimes from Linak. 1. 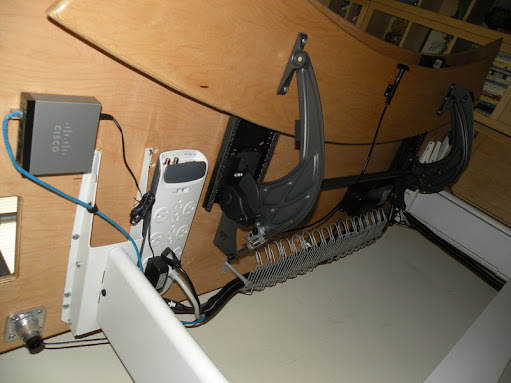 Notches at the top and sides are used for cable runs and mounting lamps, allowing the desk to press against the wall. 2. 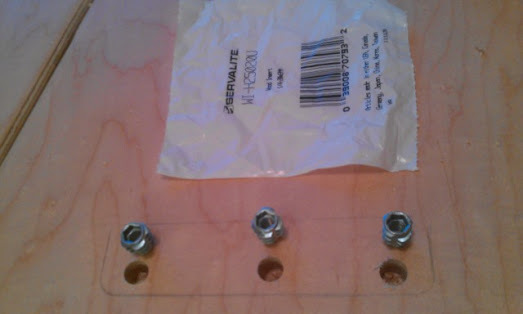 The 5 holes along the top are for 1" round tube rig, used for mounting monitor, lamp, and speaker. 3. The keyboard platform slides under the main surface on tracks, and can be tilted and elivated..
MacBeth Hard Wood in Berkeley only carries Appleply Maple, 3/4", C3, rotary cut for $111.90. They will order A1 if I buy 10 sheets. I bought it, but would not do it again. Moore Newton in San Leandro is who I would use next time. Next cut the straight edges with a circular saw. 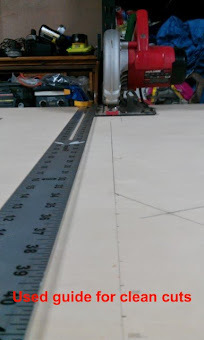 Next use jigsaw to cut the notches and arcs. 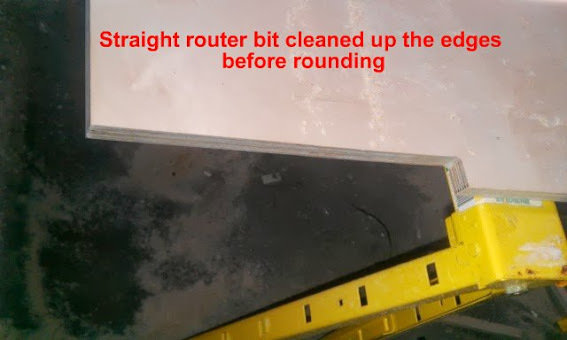 Next clean up edges with a straight router bit. Next round all edges with the quarter round bit on both sides. 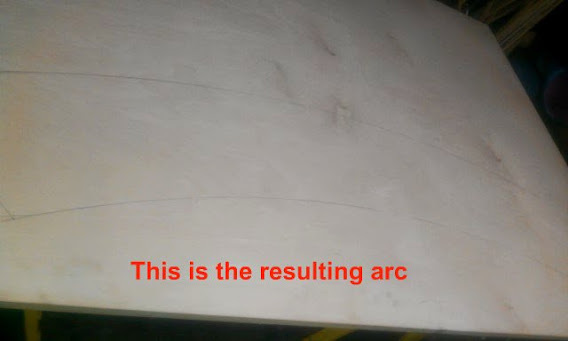 Last, cut the chamfer edge along the arc, leaving the reveal face up. This step took the most time and effort. stages: 60, 80>100, 120, 150, 180, 220, 250, 280, 320, and stop at 400. Vaccumme up all the dust at each grit change. Work out imperfections at 60 grit. Wipe it all off with a paper towel. 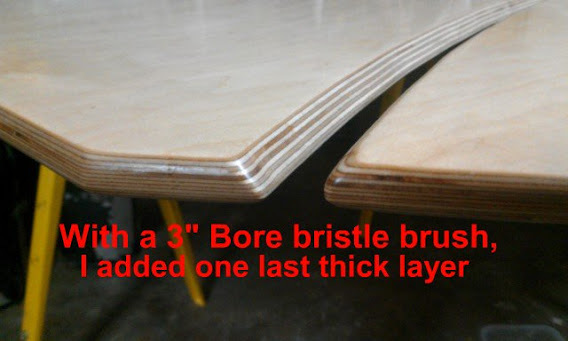 Until the wood surface is smooth and dry. 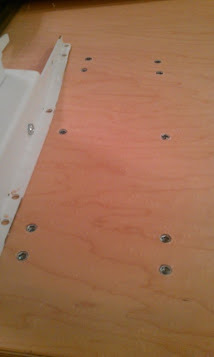 Some wood will start to stand after a few days, and the surface becomes rough. Adjust compressor air-regulator to 30PSI. 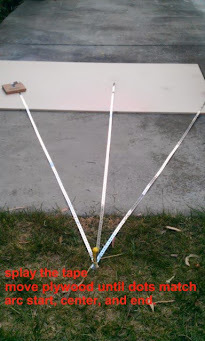 Practice on scrap to find correct balance viscosity and air pressure. Up to 50/50 mixture of thinner can be used. if orange peal, reduce pressure. avoid runs "fisheye" but don't try to fix it. 1" wide badger-hair brush from Woodcraft is another good brush for about the same price. wrap it in a piece of grocery-bag paper to keep the dust away. Soak it in thinner again before using. 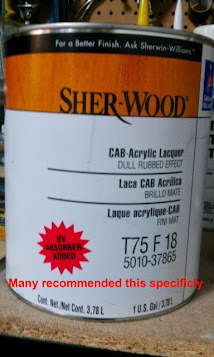 Sherwin Williams CAB Acrylic or similar lacquer, thin it with 25% "retarding thinner." Or, use clear Deft® straight from the can. 5. Apply a wet coat. Wait three minutes and shoot another wet coat. 6. 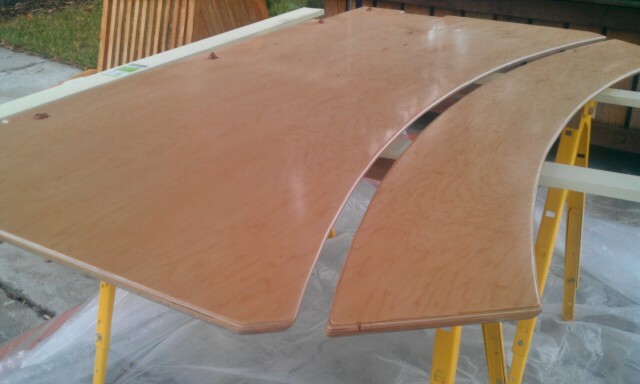 Repeat step 5 three more times (total of 9 coats). 7. 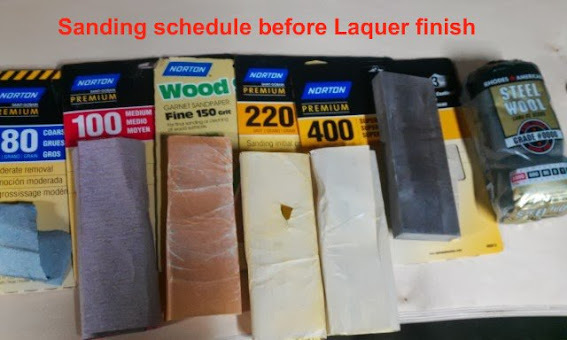 Thin the lacquer to 2/1 ratio of thinner to lacquer. Wait at least 2 days. I brush painted one last really think coat 1:2 lacquer to thinner. 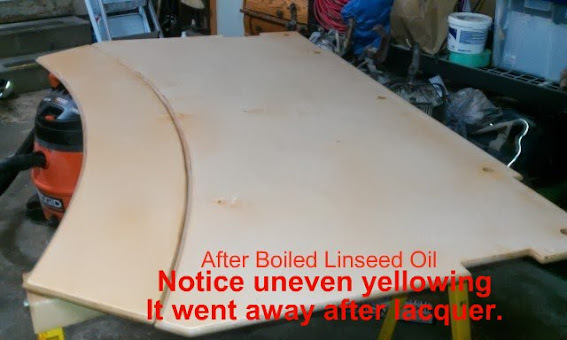 A lot of lacquer did not end up on the desk due to my spray technique(2 gallons should have made a thicker finish). 8. 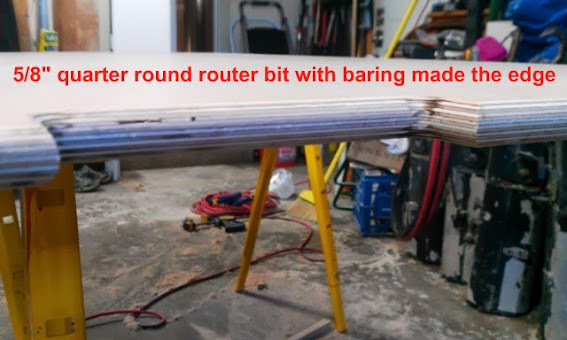 Buff lightly to remove dust, bugs, over-spray, runs, etc. 9. Wet sand with 400, 600, ... to 1000, 1500, and 2000, all lubricated with mineral spirits. 10. Polish with 4F Pumice that is lubricated with mineral spirits. 11. 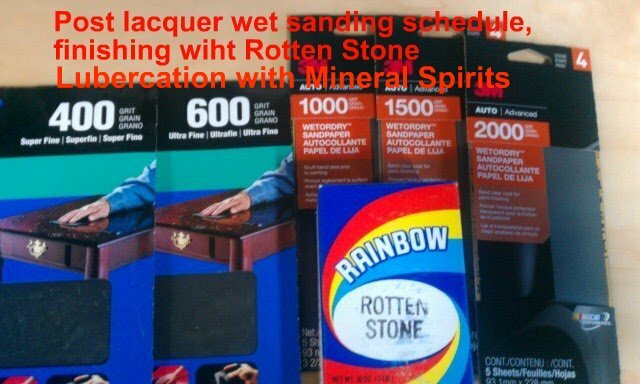 Polish the surface with Rottenstone, lubricated with mineral spirits. 12. Polish one more time with Rottenstone. NOTE1: The use of mineral spirits reduced the the degassing smell by half. NOTE2: Origninal directions called for 0000 steel wool, but I did not use it. - Herman Miller is just a ridiculous cost. Berkeley Outlet is awesome when they have stuff, but not the days I went. The back is higher than I'd like, but it is a cushy chair. Might look for a stiffer one. 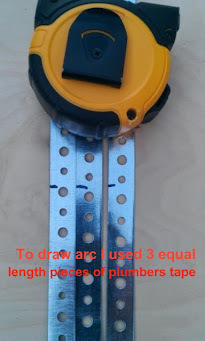 Using Aluminum schedule 40 pipe (od of 1.05).